Hobie Forums • View topic - And they walked away!!! Post subject: And they walked away!!! We need a good Crash, Capsize, Pitchpole thread. Post subject: Re: And they walked away!!! Having just capsized my Hobie 16 and not being able to right it, this incident is of interest to me. First off, they did the important thing right. Everybody walked away. First mistake was they didn't think this could happen. Having not thought through getting my cat up, I know this was one of my problems. But I'm wondering if they hadn't thought about how to get their boat up. And I'm wondering if they're doing some serious thinking on this subject now. Not only is eight million dollars of boat toast, they don't have a boat for several months. So I'm sort of hoping they invest some of their money into figuring out systems on how to right a cat or a trimaran that capsizes. Because although the scale is vastly different, they've got a lot more resources then the rest of us, but couldn't figure it out. Question whether the righting bucket (maybe with the model from the catalog who shows off plenty of skin but isn't wearing a life jacket) would have worked. Is the best way to right a cat just adding more weight, same as a bigger hammer will solve more problems? Second part of this question is whether the shroud extender idea would work? Getting the high hull on the right side of the weight equation seems like a good idea. I'm guessing that getting a rope over the high hull and pulling while lifting the mast didn't work. I'm further guessing this was due to the weight and wave conditions. Obviously, the net result was they didn't come up with a successful idea. Question is whether there was one, and whether they're going to figure out something better that will help the rest of us. Next question is whether, at some point, you do better dumping the rigging and mast overboard. Would they have done better to do this, and tow the hulls in a turtle position? I noticed the boat turtled because of the failure of the mast to survive the stress of being capsized. 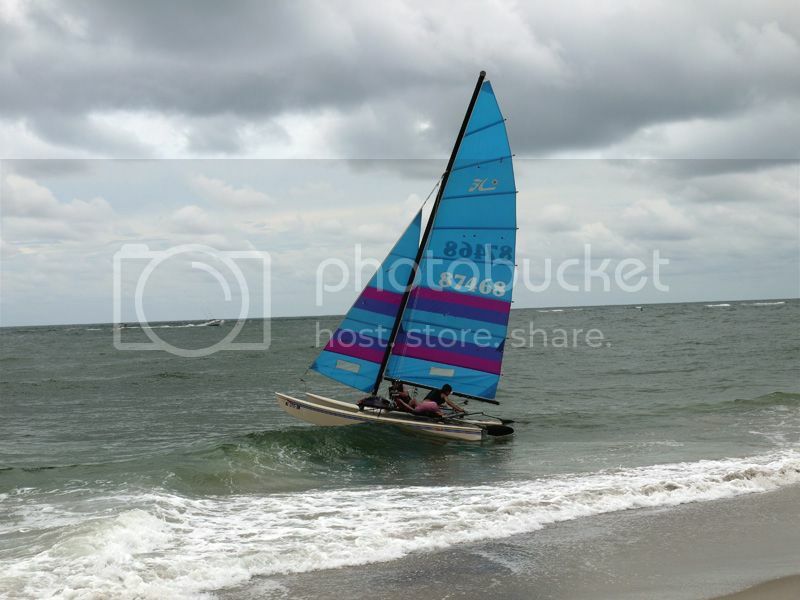 If you capsize in surf, for instance, do you do better to dump the mast and save the hull (providing you can do this safely)? Ultimately I'm wondering, with their discovery of the extent of the problem, whether some serious study is going to be done with capsizing. Maybe some work with computer simulations. Oracle has the money, and it's clear that brute strength doesn't always work. Of course, when we're out in our smaller cats, not weighing enough to right our cats, it's also clear that brute strength doesn't work all the time for us, either. It's going to be interesting seeing what comes from this. Spithiils boat (the AC 45) previously pitchpoled close after the start of a race and it was righted before the other boats were far off. Why were the daggers down? this was an expensive training run. Jim, have you searched on the Forum re capsize recovery? H16's are easy, compared with bigger and heavier cats...a lot has to do with practice and technique. Get into some warm weather, in sheltered conditions and practice. Most of us can solo right a H16 or H17, H18/20/Tiger is another story. Amazing photos Jeremy - thanks for sharing your work here. Were you around for the AC72 incident as well? I wonder what either one sounded like up close. from the looks of it, the wing on the AC72 is awfully tall, compared to the amount of bouyancy up front in the hulls, surely a trade off between wave piercing speed and stability. they bore off just a bit in 25 kts. of breeze and immediately buried the bows. notice how slow she rolled over? The original posting was about an AC72. What is the backstory on this? All I know of this is what was in the video. I appears that the canal was only a couple of feet deep since both bows also hit the bottom causing a great cartwheel type of pitchpole. From my own experience, it is not good for your boat having a pitchpole in shallow water. A couple of years ago I was on an impressive screaming broad reach toward the shore while trying my best to keep my leeward bow above the surface when a rudder hit the bottom and it was enough to pivot the bow down and cause a pitchpole. It would not have been so bad if the leeward bow hadn't hit the bottom and caused the boat to cartwheel forward (not quite as quickly as in the video). My neighbors along the shore were impressed. After uprighting the boat I noticed the fiberglass boots around two of my pylons had cracks in them so that kept my boat out of service for a few days. SNovak, thanks, I missed that. The 72's look almost exactly like the 45s, just scaled up. That is one of the area that they have speed trials I believe. A kite boarder currently holds the record speed I think... 64mph! 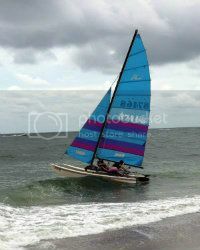 Makes our Hobies look downright sedate!